Our society has become brace happy. At the first sign of discomfort people brace joints more often than they should. 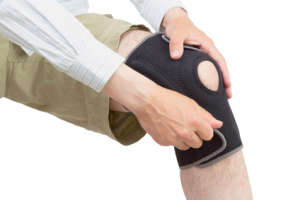 Bracing may provide temporary relief, but it can pose more extensive long term problems. However, bracing is appropriate when a joint is significantly injured or unstable and/or when any excessive additional movement can cause further injury. Knowing the difference between discomfort and acute pain is essential. Significant acute pain should be diagnosed by a medical practitioner. Bracing at the first sign of discomfort and restricting movement can actually slow down the healing process. Movement at a joint when it’s mildly injured brings blood flow to help in the recovery process. Bracing weakens the stabilizing muscles and connective tissue around the joint. Wearing a brace too long causes the joint to grow weaker, possibly resulting in a more significant injury to the specific joint or dysfunction in other related joints. The root issue of most non-traumatic joint pain is usually associated with improper movement patterns that can be simply addressed with a proper corrective exercise program.